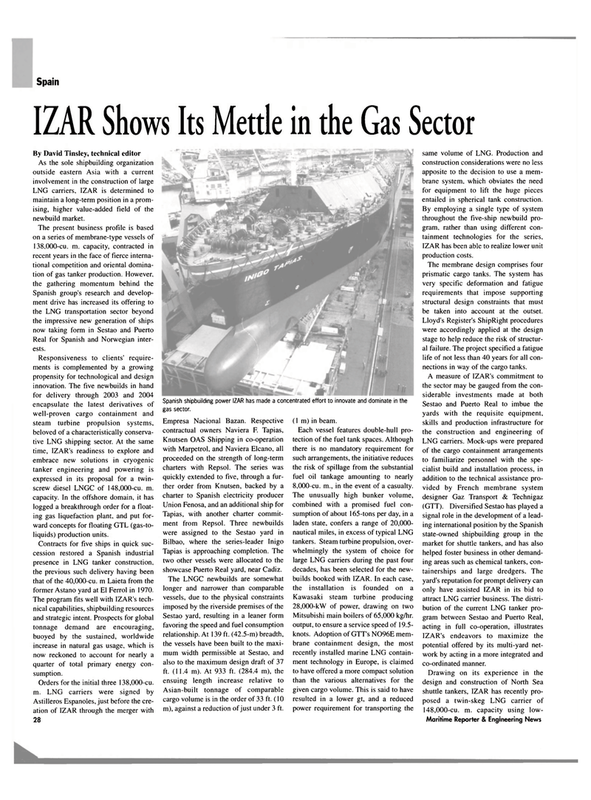 LNG carriers, IZAR is determined to maintain a long-term position in a prom- ising, higher value-added field of the newbuild market. Real for Spanish and Norwegian inter- ests. Responsiveness to clients' require- ments is complemented by a growing propensity for technological and design innovation. The five newbuilds in hand for delivery through 2003 and 2004 encapsulate the latest derivatives of well-proven cargo containment and steam turbine propulsion systems, beloved of a characteristically conserva- tive LNG shipping sector. At the same time, IZAR's readiness to explore and embrace new solutions in cryogenic tanker engineering and powering is expressed in its proposal for a twin- screw diesel LNGC of 148,000-cu. m. capacity. In the offshore domain, it has logged a breakthrough order for a float- ing gas liquefaction plant, and put for- ward concepts for floating GTL (gas-to- liquids) production units. Contracts for five ships in quick suc- cession restored a Spanish industrial presence in LNG tanker construction, the previous such delivery having been that of the 40,000-cu. m Laieta from the former Astano yard at El Ferrol in 1970. The program fits well with IZAR's tech- nical capabilities, shipbuilding resources and strategic intent. Prospects for global tonnage demand are encouraging, buoyed by the sustained, worldwide increase in natural gas usage, which is now reckoned to account for nearly a quarter of total primary energy con- sumption. Spanish shipbuilding power IZAR has made a concentrated effort to innovate and dominate in the gas sector. Tapias is approaching completion. The two other vessels were allocated to the showcase Puerto Real yard, near Cadiz. Asian-built tonnage of comparable cargo volume is in the order of 33 ft. (10 m), against a reduction of just under 3 ft. (1 m) in beam. Each vessel features double-hull pro- tection of the fuel tank spaces. Although there is no mandatory requirement for such arrangements, the initiative reduces the risk of spillage from the substantial fuel oil tankage amounting to nearly 8,000-cu. m., in the event of a casualty. Mitsubishi main boilers of 65,000 kg/hr. output, to ensure a service speed of 19.5- knots. Adoption of GTT's N096E mem- brane containment design, the most recently installed marine LNG contain- ment technology in Europe, is claimed to have offered a more compact solution than the various alternatives for the given cargo volume. This is said to have resulted in a lower gt, and a reduced power requirement for transporting the same volume of LNG. Production and construction considerations were no less apposite to the decision to use a mem- brane system, which obviates the need for equipment to lift the huge pieces entailed in spherical tank construction. IZAR has been able to realize lower unit production costs. The membrane design comprises four prismatic cargo tanks. The system has very specific deformation and fatigue requirements that impose supporting structural design constraints that must be taken into account at the outset. Lloyd's Register's ShipRight procedures were accordingly applied at the design stage to help reduce the risk of structur- al failure. The project specified a fatigue life of not less than 40 years for all con- nections in way of the cargo tanks. IZAR's endeavors to maximize the potential offered by its multi-yard net- work by acting in a more integrated and co-ordinated manner.